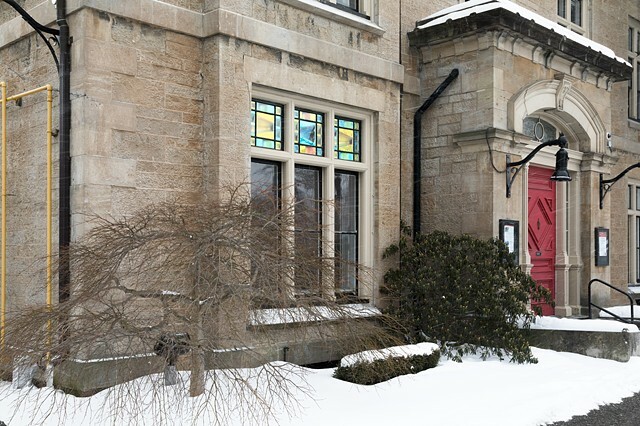 Helios Is a site responsive, temporary, light activated installation for Rodman Hall Art Centre. 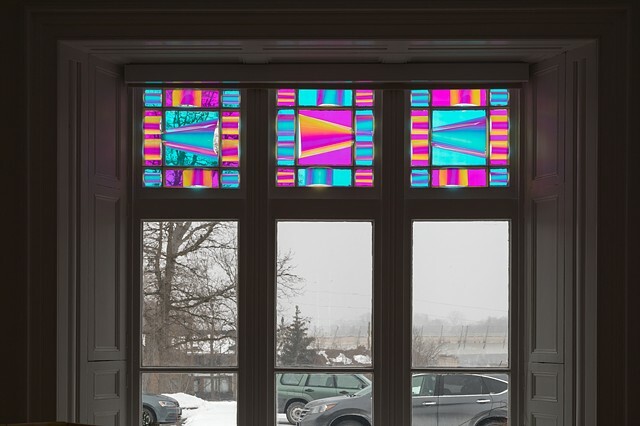 Using dichroic film, I curl, drape, and ripple hand cut pieces of this material, and apply it to the insides of each window in the historic Hansen Gallery. 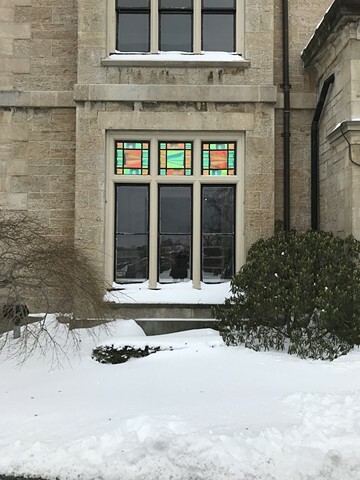 This gesture creates a kinetic and lasting impact on the interior and exterior of the building, while taking advantage of natural sunlight, artificial light, night, and day. Helios is a site responsive piece that connects with the kinetic qualities of light and the passage of time. 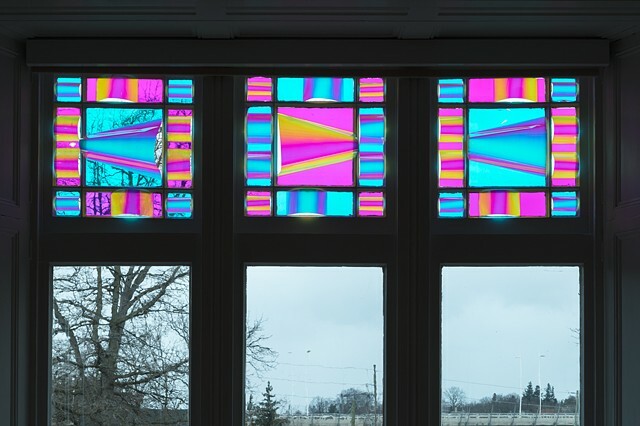 For example, a viewer’s movement produces subtle shifts in light and colour, from soft yellow through a spectrum of purple, green, and blue. 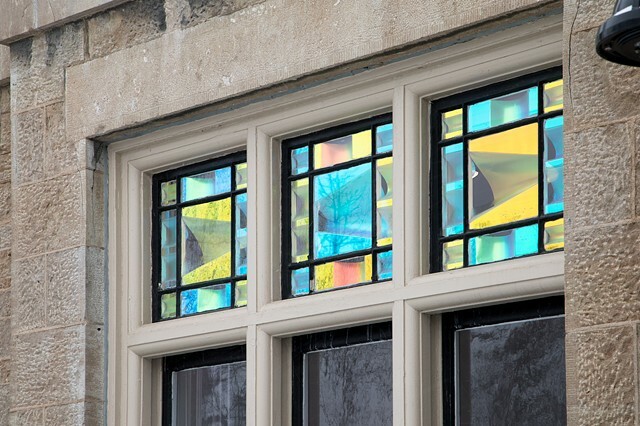 The window installation can be both still and kinetic at the same time, depending on the time of day, lighting conditions, and season. 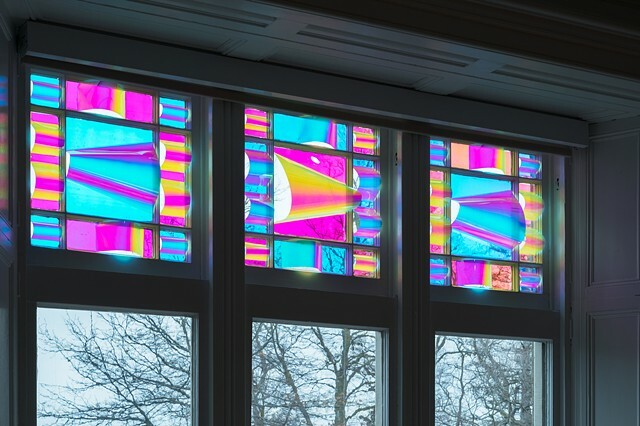 The dichroic film catches light and produces latent imagery within the architecture of Rodman Hall's Hansen Gallery. As the light changes and transitions from dawn to dusk over the course of a day, and whether the viewer is standing inside the building or on the street, a viewer experiences the work differently over time. Responding to both interior and exterior space, my hope is that a viewer will witness the passage of time within the transitory space of the window and witness the kinetic qualities of light and the slowness of time as the light changes and transitions from dawn to dusk over the course of the exhibition. Ultimately this work is about the passage of time, the ephemeral qualities of light, how it affects familiar spaces, the body, and our perception of time, and what this does to memory and immediate experience.